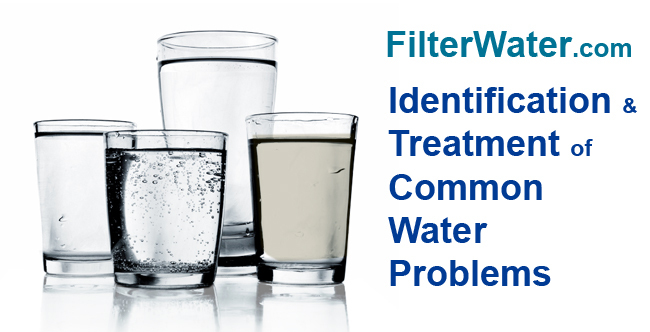 How to diagnose Common Water Problems. White or cloudy water: when air is entrapped in the water tiny air bubbles occur. This is related to temperature change, like in the winter, in some area of the country, when water is cold and the plumbing lines are warm. If you water to stand for a few moments, the air bubbles will and will usually clear from the bottom of the container up to the top. This is called entrained air and does not affect pureness of drinking water. Blue water: There are times when blue colored toilet disinfectant may cause discoloration of tap water. Possibly due to the water supply being turned off and then when turned back on gets spilled into the houses plumbing. You should not drink this water, instead flush the plumbing by running all taps until all is clear. Disinfectants contain harmful chemicals if ingested. Green water: Tiny traces of copper leaked from plumbing pipes can cause a green hue. Greenish water is commonly associated with algae in the water supply. It is recommended to fix the plumbing if you see green hue and/or copper in water. Also check your water for acidity, low pH water may damage copper plumbing. Discolored water can be the result of a water main break or fire hydrants being used in the area. Most of the time these events are temporary and in most cases harmless. There are times when household plumbing might be the culprit if the water appears discolored for a minute or two after you turn on the tap. When water comes in contact with bare iron pipes it can become discolored, this can get worse the longer it sits in the pipes. This problem can be more noticeable in the morning or after being out of the house for extended periods of time. After running your tap for a few minutes, clean water from your water heater or water main will replace the discolored water. If the discoloration is staining your clothing or fixtures, it may be iron or iron bacteria. Consider testing it , we also have there iron removing systems. Brown or yellow water from hot tap only: This is most likely an issue with the hot water heater. You should turn off your hot water heater. Once cool, safely drain, than flush your unit. Then fill and turn your unit back on. If the problem still persists, you should contact a licensed plumber. What makes ice cubes cloudy? Ice that is made at home is not stirred as it is frozen unlike commercially made ice, so there for ice crystals form an air is trapped in the ice. Light rays are distorted by the air and crystals so home ice can look cloudy in its appearance. How do you get rid of the black film around the toilet? Black slime is mold/mildew that lives in moist areas like toilets and tiles where it is warm and wet. The black buildup that you see on sink drain stoppers is non-harmful bacteria residue. The film might also be related to hard water which can leave deposits on toilets and dishwashers. These are minerals that left behind. If black stains are hard and don't have any "slimy" feel to it, you may have excessive amounts of manganese minerals. A water softener system can take care of this. Why do I get blue-green stains on sink and tub fixtures? Dibasic copper carbonate and dibasic copper sulfate from old cooper pipes can cause this blue-green discoloration. When the water containing cooper stands then evaporates this discoloration will show up on fixtures or older, porous sinks and tubs. Check your plumbing first for damage. Also check water pH , acidic water will damage copper plumbing. If pH is low we have acid neutralizer systems to aleviate these problems. What causes a rust stain? Iron can cause a reddish/brown rust colored stain after it evaporates and the iron oxidizes when the air hits it. It can be found in corroded plumbing, or if the fire hydrants were used in the area. We carry several whole house systems for any iron problem. What is the 'pink" stain? Pink stains or rings in the shower or in a water bowl that is not used frequently is an air born organism and can grow in humid or moist areas. It is a harmless. Why does water sometimes taste/smell funny? The “rotten egg” odor, or chlorine smell and metallic or metal taste are some of the descriptions frequently stated from people about their water. This can be from natural elements in the water supply or can be from chemicals added by a municipality. Either way, a granular activated carbon filter can usually take care of odor and taste issues. We suggest Coconut Shell Granular Activated Carbon. If smell exist together with brown/orange stains on fixtures, consider an Iron and Hydrogen Sulfide Removal System. What is the difference between "hard" and "soft" water? Hard water is when a high level of calcium and magnesium is in the water. Very hard water can cause white scale buildup in boilers and pipelines. On faucets and shower fixtures and heads. The use of water softener systems can help by adding sodium to the water, which acts as a softening agent. Soft water can be either water that is low in calcium and magnesium, or water that has been treated by a water softener system. We have both traditional water softeners and newer salt-free anti-scale water conditioners available for Residential and Commercial applications.